Growing up, I (as well as most Thai kids who had access to television) watched my share of Hong Kong TV series most of which were about jungle-trekking, mountain-climbing sword heroes — kind of like this or this. 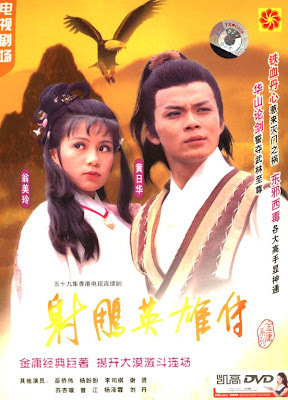 It has been several years and I have, thankfully, outgrown my fondness for period Chinese TV shows. In fact, if you were to ask me to name a few favorite shows or characters, I would have to think really hard. One thing I remember vividly, though, is what those ancient sword masters snack on. This is what annoys the heck out of me — their choice of food. Their sole choice of food. Honest to Confucius, they never order anything else. I’m not making this up. Ask any Hong Kong movie fans. Everybody who stops at an inn always orders mantou and tea. Ten times out of ten, that is the case. Good luck hoping that one of these days someone would break the food monotony and order Peking duck or wonton soup. It never happens. I don’t know why the dumb waiters even bother taking orders. Even us viewers know before the question is uttered what the answer is going to be. So whenever one of these swordmen walk in, just bring out the blessed buns and get on with the storyline already. This is preposterous. You see, I can deal with all the other unrealistic elements of period Chinese movies. Okay, so these guys can climb walls or jump up 30 feet off the ground. Some can fly or travel underground like a mole. I don’t nitpick these people on how they manage to keep the hair perfectly-styled and the makeup completely smudge-free after the most physically-grueling sword fight or years of hiking up and down the mountains. I’m even okay with the fact that even though these people practically live in the jungle, they manage to show up in immaculately clean and apparently professionally-pressed clothes always. What makes me snort and chuckle is how they can single-handedly slay an army of swordmen and five dragons while subsisting on nothing else but plain steamed buns and tea. Then incredulity leads to curiosity. Inexplicably, I find myself asking some odd questions. Could there be something magical about mantow? Could this be considered snack food for ancient sword heroes just as Wheaties is, supposedly, the breakfast of modern-day champions? (This means if ancient Chinese steamed buns were packaged the same way modern cereals are packaged, the faces of the sword heroes would grace the front of mantou boxes.) I quickly set out to find a mantou recipe. Over the last few years, one recipe after another has failed. Finally, thanks to my friend LT whose mom has been making mantow for so long that she can make them with her eyes closed, this great recipe landed on my kitchen counter. 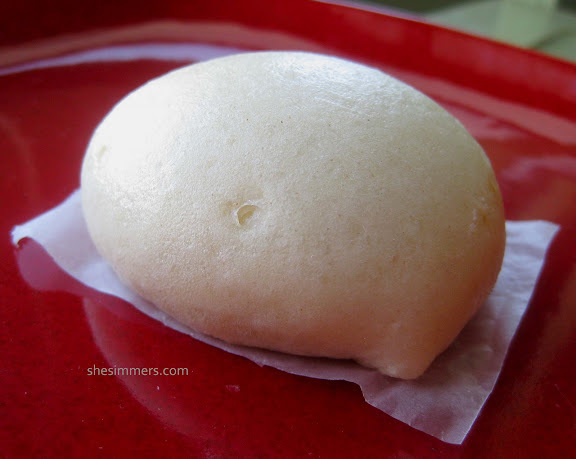 This recipe is for plain steamed buns to be eaten as a side. If desired, it can also be filled with your choice of filling, savory or sweet. Make a sponge starter by mixing together in a large mixing bowl 1 tablespoon active dry yeast, 2 teaspoons sugar, 1/3 all-purpose flour (I experimented with bread flour, but found lower-protein flour to yield better results), and 1/3 cup lukewarm water. Let the mixture stand for 30 minutes. Prepare 12 3″x3″ pieces of wax paper. Once the sponge is ready, add to the mixing bowl, 1 1/2 cup all-purpose flour, 1 teaspoon baking powder, 1/2 teaspoon salt, 2 1/2 tablespoons sugar, and 1 tablespoon vegetable oil (LT’s mom uses melted lard and suggests vegetable shortening as a possible alternative, but I went rogue). Add to the mixture just enough lukewarm water for the dough to form a ball. Add the water a little bit at a time; you want to err on adding too little as you can always add more. Knead the dough until it feels satiny and smooth in your hands. The surface of the dough should be smooth. Cover the bowl with plastic wrap and let the dough rise in a warm spot for 3 hours. Punch down the dough, sprinkle one more teaspoon of baking powder on the surface of the dough and lightly knead it in. Roll the dough into a long log. If the dough is too sticky, add flour on your work surface as needed. Cut the dough log into 12 equal pieces and place them on the prepared wax paper squares. Cover the buns with a towel and let them rise once more for 30 minutes. Once the dough has risen, get a steamer going. You want the water to be gently boling over medium heat when the buns go in. Make sure you allow about two inches of space around each bun as you don’t want them to touch each other as they expand in the steamer. 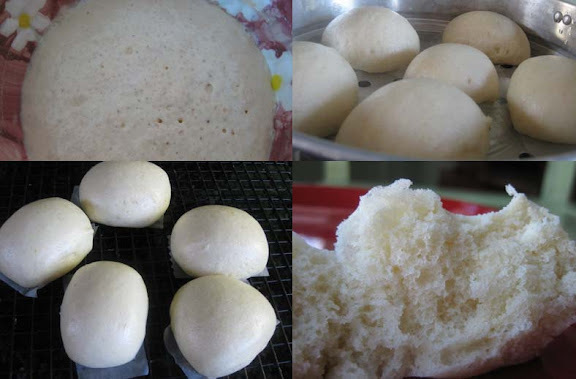 Steam the buns for 10-12 minutes. (Whatever you do, don’t let the moisture collected on the inside of the steamer lid drop on the buns; it causes very ugly blisters on the surface. Trust me.) Remove the buns from the steamer and let them cool under a towel. Additional Note (added 3-3-09): As I have noted in the recipe, lower-protein flour works better. I made another batch of this recipe again this afternoon using half all-purpose flour and half cake flour just to see how it would turn out. I actually like the combination of two flours better! Experiment to see what works best for you. Please see some tips and clarifications for this recipe here. yes, def check out Firefly, it was cute and relaxing. wow are you a smooth operator or what…this was a great post and now I need to read more..
*embarrassed* – I didn’t realise these were made plain too. I thought they were always filled with char sui! The pork buns are always too sweet for me so I’m looking forward to trying these plain ones. Thanks! Christie – I will post some non-sweet savory fillings (if that makes any sense …) and some sweet fillings for these buns very soon. Please stay tuned. It’s rather the bun and tea than they order a variety of foods and just let them sit there while they go on and on about their evil little plans. Man, what a waste of good food! I really like these. Plain and simple. Like those swordmen, I could eat them all day, every day. This is pretty amazing to me. I’ve always been interested in the portability of food, without it being fast food. I will certainly be using this in the future! Thank you so much! a) divide the dough into 24 balls instead of 12, and use two to assemble a single filled dumpling prior to steaming? b) make these as described and then, just before steaming, tear/clice them halfway open, add filling, and then seal the seam (maybe with a moistened fingertip)? Thanks for dropping by, Mike C.
A will not accommodate the filling. B is not recommended. C is the best. In fact, C will be posted sometime this week. Please stay tuned. I LOVE MANTOU. I have been waiting to eat one for so long since I moved away from Chinatown in NYC (fresh ones). I won’t even go near the frozen ones. Thanks for showing some Chinese love! We finally used your recipe to make some steamed buns tonight, and they turned out great – much better than we had made in the past. Thanks! I can’t find any decent translations for all-purpose flour and cake flour so I’m not really sure what kind of flour to buy for this recipe. Is it allright if I use a common wheat flour (for baking) instead? waruji – Not knowing where you’re located, I’m just going to assume that the regular baking flour you’ve mentioned is similar to all-purpose flour in terms of protein content. Bread flour, in general, has the highest protein content followed by all-purpose. Cake flour has the lowest protein content among the three. I made my first batch of these plain buns with all-purpose flour alone and it turned out very well. When I switched to half all-purpose flour and half cake flour and even all cake flour, the results were even better. I think it’s just a matter of preference. I’m in Sweden and the flour here isn’t named from what it is used for but from what it is made from. Regular wehat flour is what we typically use for baking. I’ll try it with just that and see how it goes. Thanks for your help! I found your site on stumbleupon and am SO excited to use your recipes (I’ve already bookmarked a few!) but am wondering what an average college student with access to nothing but an oven, pots, and a stovetop would do to make these. In my mind, anything I have that is close to a steamer would be too small to make more than maybe two at a time – is that how you do it? Also, how would one prevent drops of water from falling onto the buns? Steam uncovered? Hi Hana – What’s funny is that I don’t do a lot of steaming, yet as I was preparing to answer your questions, it occurred to me that I am equipped with FIVE different steaming gadgets. When it comes to buying kitchen stuff, I guess I have no self-restraint. What I don’t like about the metal basket steamer is the constant monitoring of the water it requires. If you add too much water, you risk having wet and soggy steamed buns. If you add too little water, you might not have enough to steam the entire batch since the size of the basket can only accommodate 2-3 buns at a time and you will need to steam several batches. It can be done, but the constant monitoring of the water level can be a pain. 5. 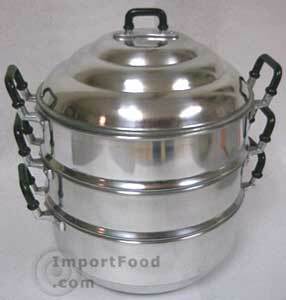 An electronic rice cooker with a steamer basket http://mathy.kandasamy.net/virundhu/wp-content/uploads/2007/02/rice_cooker_steamer.jpg (You boil the water inside the rice cooker pot and place the steamer basket on top. Easy to put together but since most rice cooker has no temperature control device, it’s hard to regulate the boiling of the water. 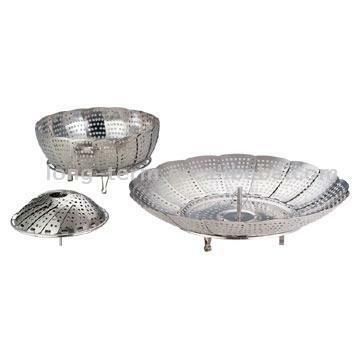 In your case, if you have a metal basket steamer, by all means, use it. Just monitor the water closely; that’s all. It’s expandable and can be used with any pot. As far as preventing drops of vapor from blistering the surface of the buns, all you have to do is exercise caution when you open the lid of your steamer or pot. The vapor collects on the under side of the lid during the steaming and the drops of water usually slide down the sides of the lid instead of dropping directly onto your food. It’s when you open the lid that this may happen. When you open the lid to check on or remove the buns, flip the lip over quickly and away from the food. That way the water will remain on the lid. Shake off the vapor drops before you put the lid back on the steamer again. Hope this makes sense. But by no means should you steam with the lid off. Leela my sister just moved to China to teach english at a medical school and one of the first dishes she was served was fried silk worms. She raves about them but doesn’t know a recipe for them.. Do you have any recipes?? Anonymous – Sorry, I’ve never had or made fried silk worms. I know a lot of people like them, though. I figure it’s just a matter if deeping frying some silk worms until they’re crunchy and golden brown. ??? Don’t know how they’re prepared in China, though. Anyone from China know? That’s a great recipe. I am going to try manton with Indian curry filling apart from regular chinese style filling. Thanks for the recipe! I’ve just prepared a bunch of these – at the moment they are resting to go into the steamer in a few minutes. I’m so excited to see how they turn out! I doubled the recipe and filled one half with the bacon/egg mixture, the other one with a sweet hazelnut filling. Love your website – so many ideas for new cooking adventures! Anon – Yep, not just a lot of baking powder, but a lot of yeast too for a small amount of flour. My first reaction, exactly. 🙂 This kind of dough doesn’t require much gluten development. In other words, there’s no need to knead it to the point where it develops the so-called gluten window. It’s more of a cross between a soft bread and a cake, really. In fact, too much kneading will cause the buns to be tough. Hard to say for sure what went wrong. It’s most likely that you needed more flour. Working with bread can be frustrating at times, because the amount of flour required to make the same recipe can vary from day to day depending on the humidity and the type/brand of flour. If the dough is too wet, it won’t proof much or form a smooth surface. Try dusting a little of flour on the kneading surface and knead that in until you get a smooth, somewhat elastic dough. Just a little at a time. You don’t want to add more than you absolutely need. Hope this helps. If the dough is now proofing, you still have to time to knead in more flour before shaping it into balls. Let me know how it goes! The dough finally proof with the help of my ‘keepwarm mode’ rice cooker. it wasn’t silky and smooth at all, but surprisingly after steamed they turned out better than expected! So Happy! my mom thinks they are a bit tough though (pretty sure I have overworked it). But overall, the buns taste nice! I have problem turning the dough into balls. Between dough they couldn’t stick together smoothly, not sure lack of water or oil..in the end I just rolled them out with rolling pin, and turn them into rolled buns (like mini swissroll) 🙂 I will try to make s’more buns again this week! The easiest way to form a dough ball would be to flatten out a piece of dough slightly, just to get a roughly round disk — not too thin. Then gather up the edge together to form a round balloon. Pinch the seam really well and place the ball on a piece of paper, seam side down. I made some of these today and filled them with char siu and other fillings and they were delicious! Thank you!! I too honestly cry during the Asian Dramas I’d always see them eating these Steamed Buns and was like it looks simple and good! I made this. It came out well, but left a thick aftertaste – I guess the yeast was old, but the dough did rise and so it was working. Anything else that could have gone wrong. Otherwise they look good. I thought I would put it up on my blog with due credit and the link to this post. Would like to incorporate the suggestions too. Thanks. I like the website – and not just the recipes but the writing that goes with it too! Great work. radha – Thanks for the kind words. It could be that the yeast was old, like you said, or it could be due to the baking powder not being interspersed well enough. The latter is likely if some buns have stronger flavor than others as baking powder tends to leave an odd after taste. But I’m just guessing here.